Gain an understanding of the process and know what to expect. Over the years I’ve learned how important it is to keep my clients informed about their case. Whatever legal issue you’re facing, I’ll help you understand your situation and all of the options you have available. I’ve been practicing law for over 5 years, focusing on personal injury, DWI defense, and criminal defense. My goal is to provide the best representation and legal counsel to give you every possible advantage. Lynsey Uhl serves as the firm’s legal assistant, providing a variety of different duties that keep our cases in order and our clients happy. Her drive and work ethic is unmatched, and I’m proud to have her on the team. Fighting a DWI or DUI can be a difficult task, especially if you’re facing a repeat offense that carries serious consequences, like the loss of your driver’s license or jail time. That’s why it’s important you have a skilled traffic law attorney who can outline a strong case for your defense. 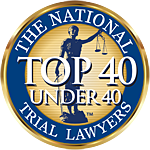 I can help you navigate the legal system. Facing the uphill battle of recovery from a serious personal injury can be extremely difficult. You may have medical bills piling up, and you could be forced to miss work while you recover. Fortunately for you, I work with injury victims across Missouri to pursue compensation that can help them get healthy and return to normal life. I’m proud to serve St. Louis County, Jefferson County, and St. Charles County. Wherever you’re located, my firm has got you covered. I understand that legal issues can take you by surprise. If you’ve been injured in an accident or you’re behind bars after a DWI charge, you may not be able to come to my office for help. That’s why I’m proud to work with clients across the St. Louis area, from Jefferson County to Charles County — and if you can’t come to me, I’ll gladly come to you whenever you need my help and support. I have known Matt Jett for almost 10 years, and he has undoubtedly become one of the most influential people I have ever met. He was there for me, without judgment, on one of the darkest days of my life. I will be forever grateful for all the hard work Matt put towards my case. Thanks again Matt. Matt Jett handled my DWI case in 2014. I called and was able to see him immediately. My case took about six months to complete and he was easily reached every step of the way to answer questions and settle my nerves. I still keep his card with me, and if I ever need an attorney again, it will be Matt Jett! I had a family friend who’s daughter got herself in a bit of trouble. He was more concerned about her well being than money. There are some people that would give the shirt off their back to save another, and he is one. I will be giving his number out to everyone. This attorney has a heart and if you are looking for someone to trust he is your guy! Allow my demeanor to put you at ease. One of the reasons I got into the legal profession was because I enjoy using my knowledge and skills to help people through a crisis. While most of us never plan to be in a position where we need a lawyer, the harsh reality is that life can throw us a curveball when we least expect it. Many of my clients come to me scared and anxious about their future. I believe it’s my job to not only protect their rights, but to help them understand what they’re facing before coming up with a plan to help them move forward. I’m committed to working with you every step of the way so that you can feel confident that your case is in good hands. I do my best to make myself available to answer any questions you may have along the way, and I’ll always be honest and upfront with you about all case proceedings so that you never feel any uncertainty over your case. I take a personalized approach to every case so that my clients never feel like just another faceless case file. I value developing a trusted relationship with my clients because providing you with peace of mind is part of my job. Ultimately, I want you to be able to rest easy knowing your case is being handled efficiently and professionally. Together, we’ll try to get the best possible outcome for your case.